← Frustrated with TV so-called “news”? You (we) are not alone! I am almost done with this book and I highly recommend it … I found it in my quest to find current ideas related to Peace and Power, which I am currently revising. There are lots of very similar ideas in this book to the ideas in Peace and Power, but the ideas are presented in a story-like fashion. It is a (fictionalized) story about the real lives of real people, is a very engaging way to get across some really challenging and deep ideas about human nature and human experience. It is the story of a group of parents who are enrolling their delinquent teen-agers in an intensive program to turn their lives around, and the parents are required to attend a 2-day intensive workshop themselves at the time they drop their kids off. In the book, you follow the narrative of the workshop, and get a glimpse into the underlying thoughts and challenges that many of the parents are facing. The group is facilitated by an Israeli Jew, and a Palestinian Arab, both of whose fathers were killed in the Palestinian/Israeli conflicts in the early ’70’s. When they met (both families had moved to the United States) they were both harboring deep wounds and bad feelings about the other side of the conflicts, but had begun a journey to heal, not only their own inner turmoil, but the root causes of personal, family, and national “wars”. I am learning a lot by reading this book, and am recommending it to everyone I know. The way it is written is engaging, but it is not the very best prose you will ever read. It is not bad … but if I were to rate the book on several different dimensions, the dimension of the overall literary presentation would not be a 5-start rating. Still, it is a story well worth reading, and the manner of presentation is a very creative way to draw the reader in to a journey of self-examination. One other feature about which I am ambivalent … the “author” is the Arbinger Institute. I have explored their web site and they address up front why they do not list the names of the actual authors of their publications. Their explanation is fair enough, but coming from a firmly rooted feminist perspective that seeks personal accountability, this does bother me. However, the work of this group is extremely important — enough so that I will probably seek out more information. And the principles upon which they work are, in my view, the principles that hold the only hope for peace — inner peace, peace in families and peace in the world. Nothing is really new here … the fundamental precept of Buber, Freire, Margaret Newman (love) is at the heart of their philosophy. But the way they go about engaging people, including the reader, gets the point across in a powerful way. 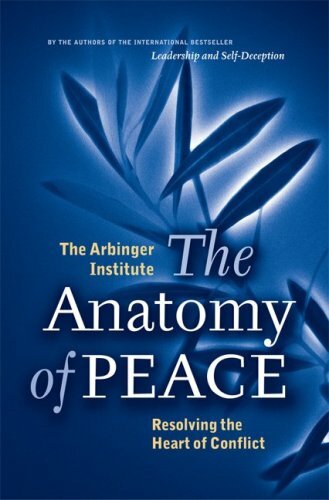 This entry was posted in Books, Making change, Social Issues and tagged Anatomy of Peace, Arbinger Institute, parenting, peace, War. Bookmark the permalink.